I adore the festive season and, let’s face it, we’ve been unable to escape the fact that Christmas is on its way. Whilst I have been waiting patiently to begin my Christmassy books for review until a bit closer the holiday, Winter Wonderland by Belinda Jones seemed a great option to bridge the gap when I read it back in November. This is a book which isn’t actually about Christmas, but has a definite festive feel about it. I love the cover, it conveys the story and feel of the book well and I imagine it could appeal to a wider audience than previous covers for Belinda’s books. I would definitely be drawn to this book if I hadn’t been lucky enough to have it sent for review. The book tells the story of recently divorced Krista, a travel journalist, who along with her best friend Laurie, runs Va-Va-Vacation, an online travel planner, which on this occasion sees Krista reporting on Quebec’s Winter Carnival. Whilst Krista usually plans thoroughly before any trip, a last-minute switch means this is one trip she is ill prepared for. What transpires is a trip which surprises Krista on many fronts. From staying at the ‘Hotel de Glace’ through to husky-dog sledding and being propositioned by the supposed snowman ambassador for the carnival, Bonhomme, Krista experiences this carnival to full effect! I felt completely immersed in this book and felt like I was truly transported to this "Winter Wonderland." There is a ‘dear reader’ message at the start of the book which is a nice touch and sets the scene, preparing you for the cosiness you’re about to experience! I warmed to Krista immediately; the story is in first person viewpoint. There are some very funny opening chapters about her experiences at the Hotel de Glace, haven’t we all imagined what it would be like to stay at an ice hotel?! Wonder no more. I thought the pace was very quick initially and it suited the story as Krista has so much to cram into her short trip! This slowed down about half way through then picked up speed again towards the end, I thought this balance was just right. Although I enjoyed the humour in the book, I started to wonder whether it would become a bit too much, like it was trying a bit too hard– but this wasn’t an issue. Whilst the humour is maintained throughout, there is greater depth developed to the character’s stories as it progresses. Whilst the story centres on Krista, there is plenty of activity and intrigue regarding the supporting characters brought into the mix (the rugged and mysterious Jacques, the changeable and mysterious Malhomme). 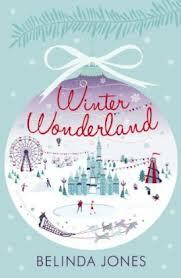 What I enjoyed most was the feeling of being transported to this "Winter Wonderland" and experiencing all the fun things Krista gets up to on her trip, pure wintry escapism. I’d never heard of the winter carnival before reading this book and it’s been great to look online at the pictures of the places used as inspiration for this book since finishing it, including seeing what Bonhomme himself looks like! The fact that the images I had in my head match what the real Hotel de Glace looks like for example is testament to the writing, if anyone wants a peep there is a great virtual tour here. Belinda notes the actor who inspired the character of Jacques, I hadn’t heard of him, but looking at him I can see why, a perfect fit and swoon! I also love it when characters feature in different books so I was pleased to find out that Krista’s best friend Laurie will be the central character in Belinda’s next novel, The Travelling Tea Shop. If you love winter and the festive period I think this is the perfect book to get you in the mood! I’m going Christmas shopping now, in my snugly boots, gloves, hat and scarf...goodbye. Thanks to Hodder and Stoughton for the book in exchange for an honest review. Belinda has some copies to give away during her interview! This sounds like a good read. I like the setting and like to add a book in every once in awhile that offers a dose of humor. Thanks for your great review.